Our goal is to help you optimise your business operations with a combination of solutions, technology, support and expertise. Backed by a team of experts and professional services best practices, RAP professional services will help you make the most effective use of the RAP platform by integrating with existing systems, processes and operations. RAP’s Analytics Suite provides powerful performance measurement, attribution and risk analysis tools. The RAP Analytics Suite includes Performance Measurement,Equity Performance Attribution, Fixed Income Attribution, Risk Attribution and Decomposition. 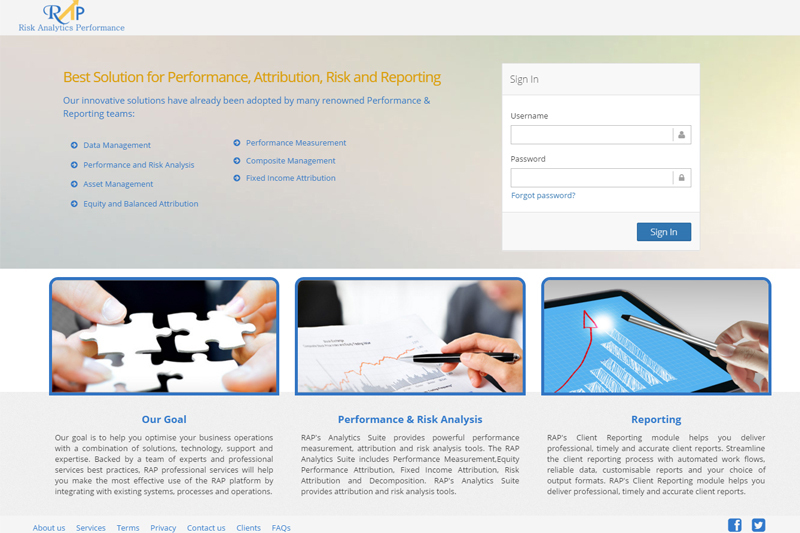 RAP’s Analytics Suite provides attribution and risk analysis tools. RAP’s Client Reporting module helps you deliver professional, timely and accurate client reports. Streamline the client reporting process with automated work flows, reliable data, customisable reports and your choice of output formats. RAP’s Client Reporting module helps you deliver professional, timely and accurate client reports.